As we near the end of 2018, Twitter has looked back on the year that was by revealing the most talked-about brands, hashtags, people and issues in Australia on the platform. They found Aussies took to Twitter to engage in a range of conversations, topics and movements, from popular Korean boy band #BTS, to political issues and a change of Prime Minister through #auspol and #libspill, as well as the sporting spectacles of the #WorldCup and #AusOpen. Taking a look at the hottest finance topics on the social media platform in Australia (based on how often each hashtag was used), cryptocurrency continued to reign supreme in 2018. Tags to Bitcoin, Blockchain, Ethereum and XRP (Ripple) all made the top 10 list, with investors discussing their predictions and summarising movements in the market. Twitter users (Twitterati? Twitterians?) kept up to date and shared breaking findings from one of the largest investigations our financial services sector has faced with the banking royal commission. We also saw what was important to Australians as they shared their thoughts on the release of the Federal Budget in May. 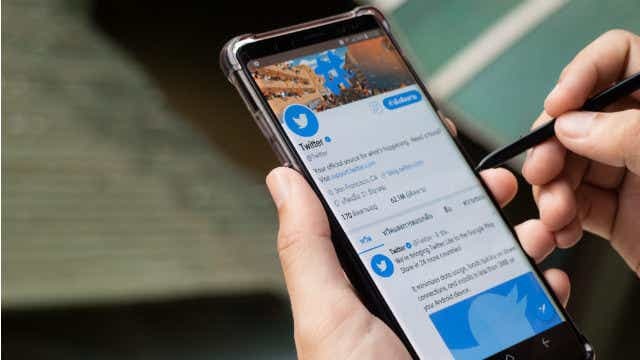 Twitter found three of Australia’s big four banks topped the list of the nation’s most engaged brands on the platform in 2018, with National Australia Bank taking home the number one spot, ANZ coming in third and CommSec in ninth. So, what likely made Aussies tag and interact with @NAB, @ANZ and @CommSec in 2018? National Australia Bank (NAB) topped the list of most tweeted brands in Australia this year, beating out a range of other prominent labels such as Xbox Australia, Samsung, Apple and Telstra. Below we round up some of the popular topics where the @NAB username was tweeted or mentioned in 2018. One of the more obvious probable reasons for interest in the big banks this year has been the banking royal commission. The inquiry into banks and financial services firms has revealed misconduct across the industry and has spurred discussions on Twitter. NAB was one of the big banks to face the public enquiry, accused of charging fees for services they did not provide and of labelling some fees as commissions to avoid refunding consumers. When the 2018 Federal Budget was revealed in May, NAB broke down what it could mean for everyday Aussies by hosting a live stream on Twitter featuring insights from its Chief Economist Alan Oster. This proved very popular among audiences, with 106,000 viewers tuning in to the video on Twitter and many people interacting with the NAB brand on the platform. In a surprise move in September, NAB announced it would keep its standard variable mortgage rate on hold, despite a wave of rate hikes from Westpac, ANZ and Commonwealth Bank. 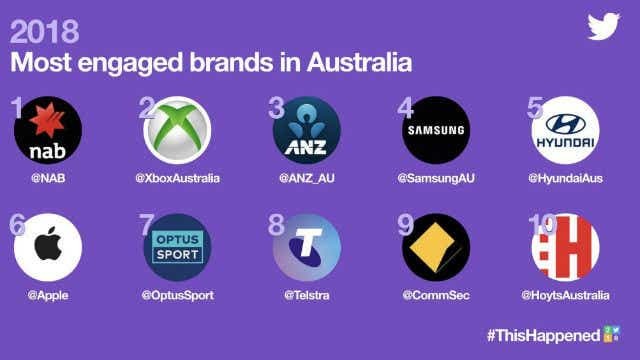 ANZ again made it into the top 10 most tweeted brands, this time improving from sixth place in 2017 to third in 2018, or second on the list of finance brands in Australia. Some of the most tweeted topics surrounding @ANZ_AU this year included the banking royal commission, the Sydney Gay and Lesbian Mardi Gras and the Australian Open tennis. The royal commission also aired misconduct within ANZ during hearings in August. Discussion of these cases of misconduct and unfair dealings at ANZ were shared across Twitter, in particular the story of Charlie Phillot who was forced to leave his farm after the bank took over his Landmark Financial Services mortgage and devalued his property. In 2018, ANZ continued with its sponsorship of the Sydney Gay and Lesbian Mardi Gras, with the supporting hashtag #SoMuchYAY. This hashtag, along with @ANZ_AU, was widely shared on Twitter during the Mardi Gras celebrations. ANZ again took on part-sponsorship of the Australian Open this year. As the #AusOpen was one of the most tweeted hashtags of 2018, it was no surprise that @ANZ_AU also had strong engagement as a major sponsor, as did tags relating to its tennis program for children, ANZ Hot Shots. CommSec just made the top 10 most engaged brands on Twitter this year, taking out ninth spot. It also managed to snag a podium finish as the third-most engaged finance brand in Australia. The company is operated by the Commonwealth Bank of Australia and is one of the country’s largest share trading firms. CommSec uses online platforms, such as Twitter, to share its latest news and information on the Australian and international markets, and thus receives regular engagement from investors. Some of the most interacted Twitter content with tags to @CommSec this year included Chief Economist Craig James’ comments on the increasing cost of petrol, CommSec’s quarterly State of the States reports, the stock market falls of February and October, and US-China trade meetings.